St.Michael's Mount, Cornwall with its beautiful garden, and castle full of history, is one of the most visited National Trust properties in Cornwall. Formerly a Benedictine Priory and Castle this has been the home of the St.Aubyn family for 300 years. Separated from the town of Marazion and the mainland by a 500 yard long granite causeway, it can be reached by boat when the tide is in. 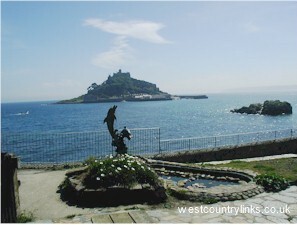 St.Michael's Mount is open to visitors Mon- Fri during the season.